Note: The following is one person's professional opinion on the safety of algae scrubber lights. You should consult your own professional advice and opinion from an independent electrical engineer, electronics engineer, electrician, or safety technician. With the increased usage of natural algal filtration, comes the increased usage of illumination to make the photosynthetic filtering process occur. However, a certain type of light has come onto the market, and this light needs to be addressed because it is potentially unsafe when used on ATS algae turf scrubbers. If you do not have these lights, then you can decide whether to use them for DIY them or not. If you already have them, then you can learn how to protect yourself. Even if you have 1, 2 or 6 of these lights, and they've had no problems for 6 months, or a year, or three years, that does not mean that other people should not be informed. Imagine if your car had a defect that only showed up for 1 in 100 people, and you were the one that got injured. Would you want the car company saying "There is no defect. We have a customer that has two of these cars and he's had them for three years; if there were a defect he'd know about it." Of course not. You would want the pertinent information. And as a maker of LED lights, and being an Electrical Engineer, I feel I am qualified to provide this information. 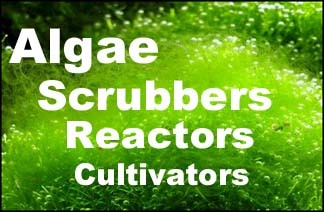 Several scrubber builders were asked to provide input/articles to be included here; nothing was received. Also I offered to provide free electrical design advice to improve the safety of their scrubbers; all declined. What does hermetically sealed mean? It means it's air-tight. And if it's air-tight, it's waterproof. It would be difficult to make the metal-case lights air-tight, because you would have to basically weld the case together. The most common way of making electronics air-tight and waterproof is make them a solid component, like we did with our GEM lights. No air space inside at all. All other aquarium sump equipment has the 240/120 volt area hermetically sealed: power heads, heaters, etc. The metal-case LED lights that are being used for algae scrubbers seem to be the only equipment not sealed properly. If you are going DIY and already have a set of the metal-case lights, you are best advised to just not use them and just get a safer light instead. At the very least, use a GFCI protector, available at any hardware store. A safer option would be a low voltage DC version of the same light, with a remote power supply that either comes with it, or that you get and connect yourself (just make sure to get a UL certified supply). With a really long 2-meter DC cord like we use, the 240/120 volts can at least be placed far away from the sump. However, this does not solve everything. These low voltage DC lights typically are not grounded on the DC side, so when the 240/120 volts hits the LED diodes inside, the diodes are either going to fail open, or fail closed. If you are having a bad day, they will fail closed. The lights typically use Chip-On-Board (COB) designs which put the diodes within one millimeter of the ground plane, and a 240/120 volt shorted diode will easily arc to the nearest piece of metal which is probably now going to be the metal case. So you once again have a 240/120 electrified case waiting to be touched in your sump area, and you will no doubt be touching and grabbing the light to inspect why it is no longer turning on. Before this design in 2008, scrubbers were either dumping buckets, or horizontal rivers. Those worked, but had even more problems than our waterfall, and the buckets/rivers were not 2-sided like our waterfall was (with lights on both sides of the growing surface; very important for filtering). But even with our waterfall, the screen sometimes would fill with growth and would clog the water slot, causing water to spray up and out of the box, onto the lights. Back then we watched for this, and DIY people expected it. But using metal-case lights on a open-top box could have water spraying directly onto the lights, which as shown above, could leak right into the case. Another hazard of our previous waterfall design, especially when there is no top “shelf” covering the light, is that in order to lift the screen out of the box (for cleaning), you need to place your other hand onto the box to hold it down; the proximity of the lights to the top causes your hand to touch the metal light case when doing this. This is the worst case scenario for electrocution, because as you learn when repairing televisions, it creates the most direct and shortest path of electricity from one arm to the other, directly through the heart. The DIY solution for this is to make a large top shelf over the lights that will absolutely not allow your hand to touch the lights. The pre-made solution can be similar, but the real solution is to change the power supply for the lights to a remote, low voltage, AC/DC isolated, UL certified power supply. Like we did. A safer solution that all DIY and commercial scrubber makers can use is a remote “switching” power supply, with at least 3000 volts isolation from the mains, with a long 2 meter DC cable so the 240/120 volt box can be far away from any splashing, wet carpet, interested children, pets, etc. The power supply needs to be UL certified, with the “eXXXXXX” number on its label, so you can cross-check its manufacturer on the UL website. We have had more than one Chinese supplier say they had UL certification, but upon checking, they were actually using the number from another company, and thus providing an inferior, untested product, even though the price was increased! Lastly, the enclosure for the lights should not be metal, even if they are low voltage. This will protect the customer even if the power supply box is splashed, because the 240/120 volts will not have a metal case to conduct to, and injure, the customer. 240/120 volts simply has no business being inside of a non-hermetically sealed metal enclosure that is subjected to hand placement, salt creep, and direct splashing by saltwater. The commercial pre-made scrubbers using these lights are the only aquarium equipment I know of that does this, and they need to be made more safely. So I challenge all pre-made commercial scrubber makers to replace their metal case 240/120 volt low-cost lights with safer options. Yes these options will cost more, and you will lose a lot of your profit. But I bet you can do it. Like we did. Further, all customers that already purchased metal-case lights should be offered to have the lights replaced with safer alternatives. Each month that goes by allows corrosion and salt creep to penetrate the seals further, and so the sooner these hazardous lights can be replaced, the better. - For metal enclosures, has every enclosure had it's ground path tested to the ground pin of the power plug? Last edited by SantaMonica; 09-20-2018 at 10:24 PM.